The People’s Plan for the Riverfront Ribbon presents a vision for a 500-acre riverfront park on the banks of the Don River. 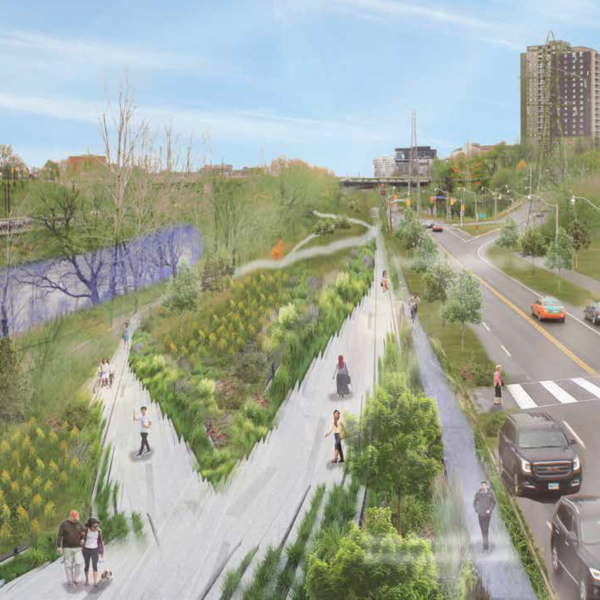 Emerging from Evergreen’s Ribbon at the Lower Don campaign, the People’s Plan embraces the potential to reconnect Toronto to the Don River Valley. The People’s Plan asks us to imagine audacious design interventions at key locations throughout the Lower Don, developed by leading North American landscape designers. The city is waiting to be drawn into the valley, to embrace it as a shared green landscape for the existing and emerging neighbourhoods that surround it. The interventions in the People’s Plan aim to ignite new places, and to connect them seamlessly to each other and to the rest of the city, bridging the roads and railways that have kept the valley fragmented for so long. The interventions strive to recognize and restore the valley’s role as a natural system, and to highlight its rich history of institutions, recreation and industry. In doing so, they aim to build stronger physical and social connections between the city, its people, and the valley. The People’s Plan for the Riverfront Ribbon presents a vision to bring people back to the banks of the Don River, allowing them to find its special places and to make this riverfront park their own, and transforming Toronto’s relationship with the river at its heart. Inspired by the People’s Plan and University of Toronto’s Landscape Architecture studio project, Evergreen Brick Works created a plan for the Don River Valley Park.